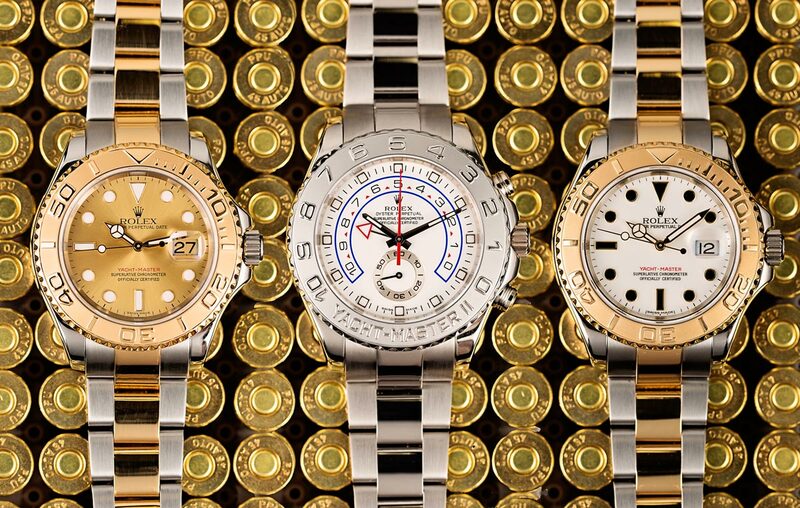 Rolex has a long history of manufacturing watches specifically designed for niche sports and highly specialized environments. From cave exploring to deep-sea saturation diving, Rolex has been an industry leader at producing watches that could thrive in conditions under which a regular timepiece would be rendered useless. 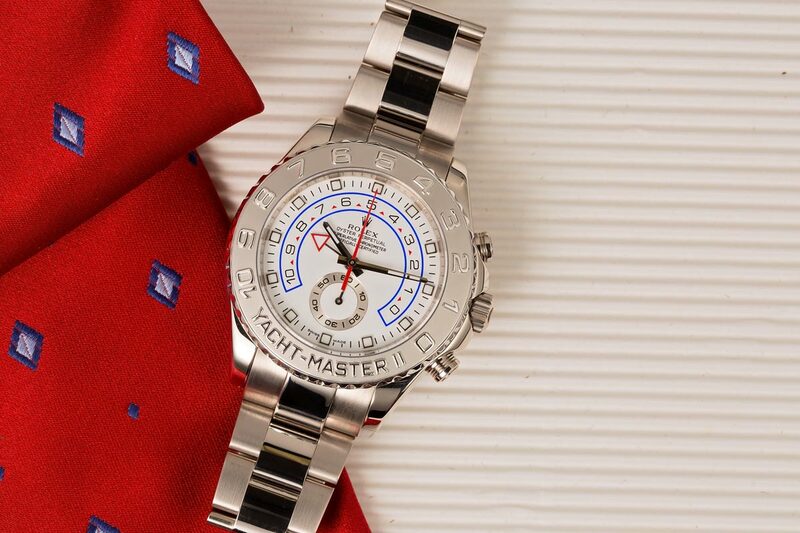 The Yacht-Master II is their latest line of over-engineered sport watches to score big points with collectors and enthusiasts for its bold style and highly complex design. The Yacht-Master II has a few additions to it from its predecessor. While the original Rolex Yacht-Master was more-or-less a luxury-oriented version of the Submariner, the Yacht-Master II is a true regatta chronograph with a fully programmable countdown timer. Outside of boat racing, the practical applications for such a complication are rather limited, and given the exclusive and highly specialized nature of the sport, very few Yacht-Master II owners are likely to use its regatta timer at all in daily life. Despite its limited practical applications, the Yacht-Master II has become a popular choice for celebrities and collectors alike. Few owners will ever use its adjustable countdown timer; however its bright blue, ceramic bezel and 44 mm case diameter make it one of the most eye-catching designs that Rolex has ever put forward. Many famous people wear this watch, celebrities and athletes alike. This bold style has made the Rolex Yacht-Master II a favorite among actors, musicians, and professional athletes alike. From Mark Wahlberg to LeBron James and Cam Newton; from Roger Federer to Flo Rida and Chris Brown, many of the world’s biggest celebrities choose to wear Rolex’s regatta chronograph in one of its many metal variations. Although very few of its celebrity owners are likely to use the Yacht-Master II’s adjustable countdown timer at all during their personal lives, the unique and highly complex function of the regatta chronograph is easily its most noteworthy feature. Comprised of more than 360 components and featuring a mechanical memory with on-the-fly synchronization, the entirely in-house caliber 4161 movement is packed full of Rolex’s latest and greatest technologies. 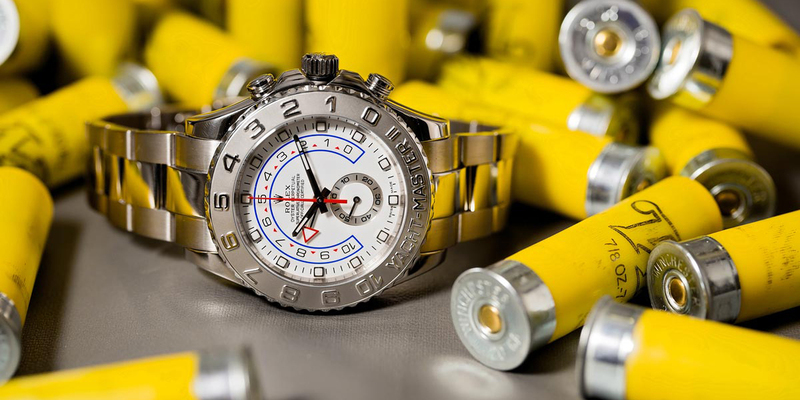 The vast amount of control necessary to program and operate the regatta timer is facilitated through Rolex’s Ring Command bezel, which links the outer rotating bezel of the watch to the inner-works of the movement. Turning the bezel locks the lower chronograph pusher and engages the setting mechanism for the countdown timer (displayed by the red triangular hand). The Yacht-Master II can easily be read in the dark for its large luminous markers. In 2017 the Yacht-Master II saw minor changes to its dial and hands, although Rolex did not issue the watch line a new set of reference numbers. Instead of having baton-style hands like the Rolex Daytona, the Yacht-Master II now has “Mercedes” style hands like the rest of Rolex’s sport watch lines. Additionally, the hour marker at the 12 o’clock location has been changed from a square to an inverted triangle to help enhance legibility in dark settings. Although very few individuals find practical applications for its adjustable regatta timer, Rolex’s Yacht-Master II has developed a strong following due to its bold and instantly recognizable design. While it is certainly a visual departure from Rolex’s classic aesthetic, the Yacht-Master II is part of a longstanding Rolex tradition of producing state-of-the-art, ultra-niche watches specifically designed for the world’s most prestigious and exclusive sports. Just as yachting is an exclusive sport, this Rolex watch from Baselworld 2017 is just as exclusive.